I have fond memories of my childhood bed; the cocoon of flannelette sheets and the weighty warmth of hospital-style waffle blankets. My mum would religiously make me a hot water bottle in the winter and I’d wrap my sock-clad feet around it, wishing its warmth to return come the early hours. 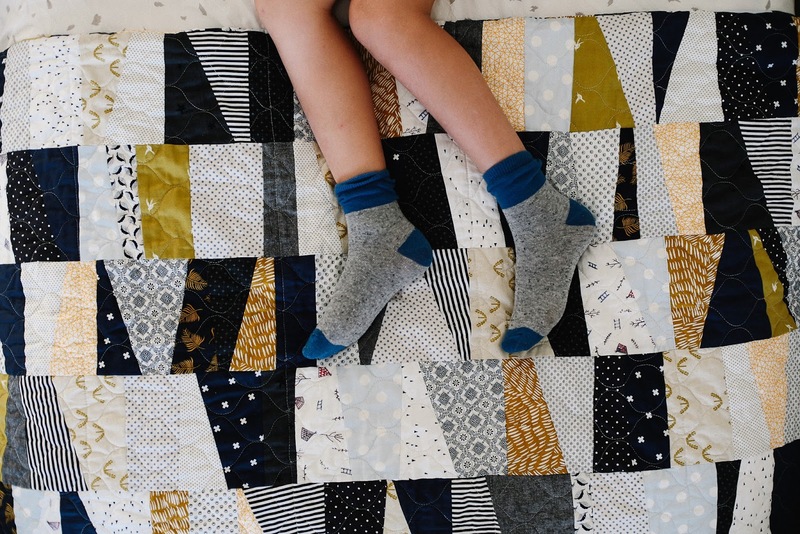 I want to create the same cosiness and warmth for my own children so when Poet was born I decided that I’d buy her a custom-made quilt for her first Christmas. I wanted to mark the occasion with a bespoke gift made with love; something she would find comfort in from babyhood to her teenage years. That’s a lot of expectation for a collage of fabric scraps, isn’t it? Four years on I can confidently say that it was one of the best gifts I have ever bought her. 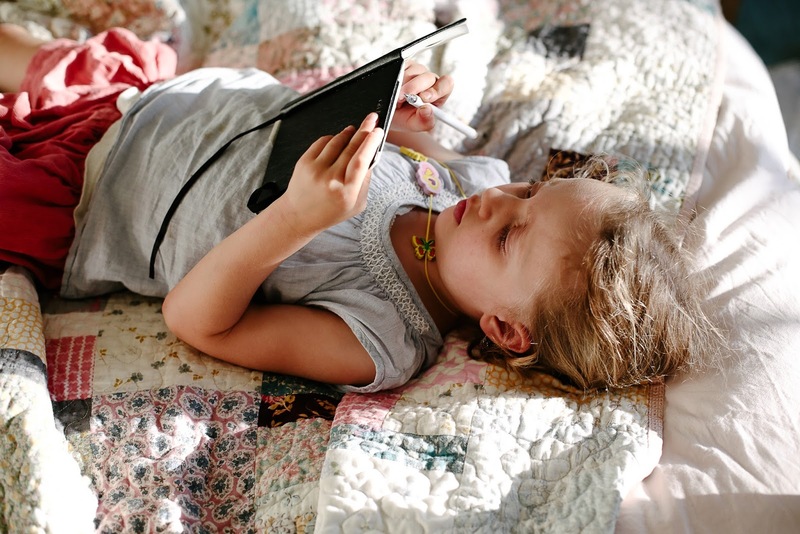 We have spent many hours looking at all the pictures on the fabric and tracing our fingers over the stitching, it’s provided that much-needed extra layer on cold nights and perhaps, most importantly, it has been the ultimate comfort blanket when sniffles and fevers have taken hold. 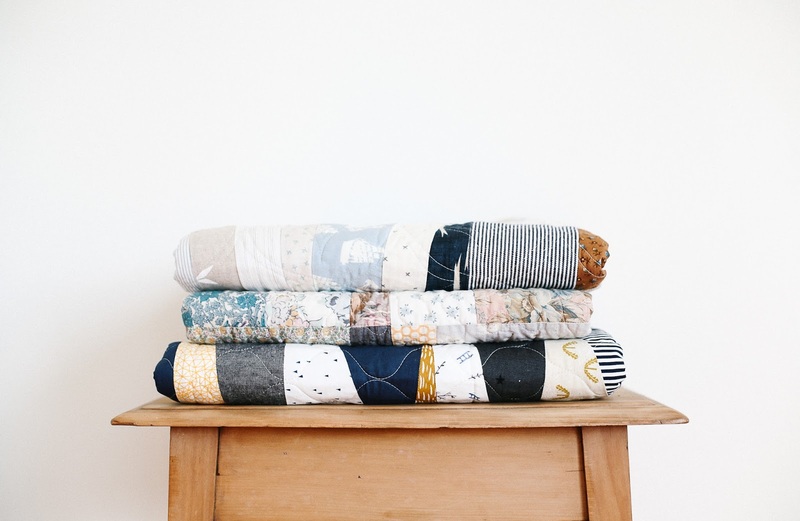 I knew before Percy was born that a quilt would be the perfect first birthday gift so late last year I contacted Kathryn from Maggie & Sparrow and sent her my preferred colour palette which, if I’m honest, was a little up in the air. I’m terrible at making decisions when it comes to big projects (I’d be hopeless if we were ever to design and build our own house) so I mentioned something about sea-inspired colours – sage, blue, navy, teal, sand – and I also asked for some earthy tones – mustard, rust, ochre. The result is everything I didn’t know I wanted which proves that Kathryn is both a mind reader and an expert quilter. And then I realised that Che didn’t have a quilt and he was well past his first birthday. And so we made it a special “just because” gift and he and I talked about colours and patterns and pictures. He asked for navy and yellow, some stars and stripes. I sent Kathryn an off-cut from a teepee fabric I bough years ago from Melissa Wastney as well as the fabric envelopes from a recent Fictional Objects sheet purchase. The quilt arrived last week, wrapped in brown paper and aptly tied with string. It is bold and grand, perfect for my avid reader who likes to cuddle up with a novel on a daily basis. And so right for this time in his life as he ventures from childhood into the tween years. It may be far-fetched but if ever there was a fire, I’d grab these quilts if I had the chance. There is a part of me that envisions them on teenage beds and perhaps on the armchair when the kids have left the nest. And perhaps, just perhaps, they’ll be treasured long enough so that they can be wrapped across newborns of the next generation. My hopes may be high but they’re valid, I think. You can see some of Kathryn’s most recent quilts on instagram. 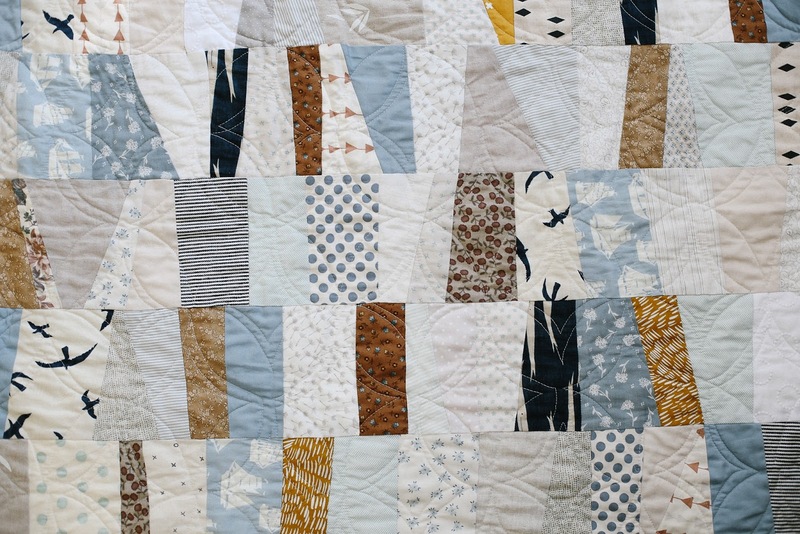 When I was six my aunty on my mum's side sewed me a quilt (completely by hand!) in soft floral tones, big enough for a double bed. It's now spent 22 years on my bed, was the first thing I packed when I left home, and I've treasured its patterns and warmth and familiarity it brings. Its definitely seen better days but it's intact for the most part. I'll treasure it till it falls apart and I'm sure your children will do the same. Actually I think Mum went through a bit of a quilting stage after this and made my two brothers quilts as well. Both the boys are less sentimental beings and so their quilts remain at home and keep various family members warm when they visit. All three are beautiful, but I love the colors and shapes in that first-pictured quilt especially. I too yearned for a custom quilt for my baby as I prepared for her arrival last year. 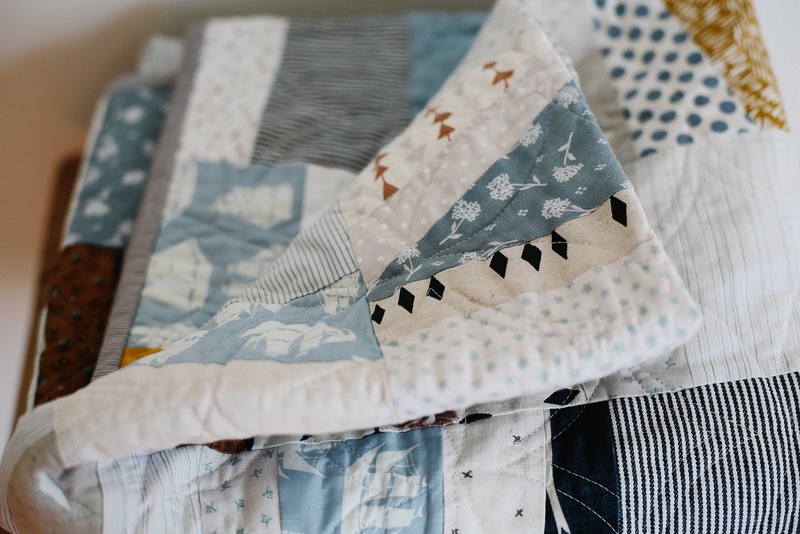 But after a number of conversations with the quilter I'd chosen, I discovered she still had the quilt that had drawn me to choose her in the first place, so I opted for ready-made over custom. I loved that it paired a simple modern pattern on one side with vintage fabric on the other. Old + new. We've already made many memories cuddling with the quilt and storybooks, and I anticipate many more. Love that you treasure your three, and I'm sure your family will too.